Along with many other homeowners we have met, these Plainwell, MI homeowners found us at the Kalamazoo Home Expo & Garden Show, which is typically held in March. These homeowners on Lake Doster were looking for a little revamp of their existing landscape. It was a bit overrun with weeds and just needed a small update. They wanted to keep it low maintenance and still have it look beautiful. Living on Lake Doster means lots of enjoyable time outdoors. Kids, and adults, get to play in the lake and in the yard when the weather permits, so having a low maintenance landscape is key. At the bottom of the stairs from the deck, there was an existing grassy area that led to the steps which then led to the lake. This area was pretty small so mowing was difficult. We removed the grass and replaced it with river rock. Along the edge we added a small ‘curb’ to retain the area. 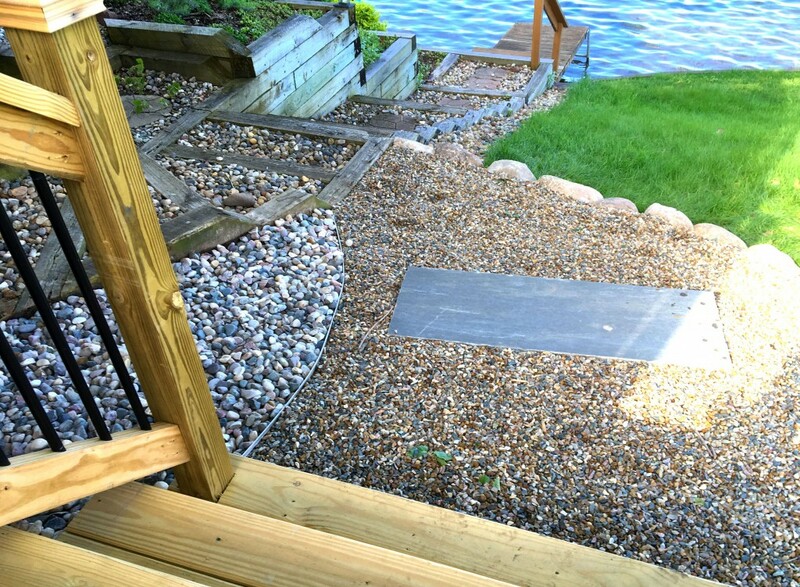 We also added a small step which was needed due to the slope going from the bottom of the stairs to the stairs to the lake. The homeowners opted for river rock instead of a traditional bark mulch to keep the landscape looking fresh and clean. River rock may be more expensive up front, but it does last longer and typically stays in place better than traditional mulch. To keep the landscape plants low maintenance for these Lake Doster homeowners, we picked some of our favorite low maintenance shrubs and perennials including Limelight Hydrangeas, Knockout Roses, and a few Black Eyed Susan’s for that pop of color. Contact us today to get started on your next project. Be sure to follow us on Facebook, Pinterest, and Houzz to see some of our latest projects. Subscribe to our newsletter for lots of ideas, tips, and inspiration for all your outdoor living dreams!